Here's No Surprise: We're all being tracked by the TSA. Which, of course, makes my wife a terrorist. Sheesh. Thanks to the Boston Globe for publishing this story. As I have said many times, while President Bush made a bunch of mistakes, his biggest was going along with Congressional Democrats and setting up the Department of Homeland (I hate the name "homeland") Security and the TSA. 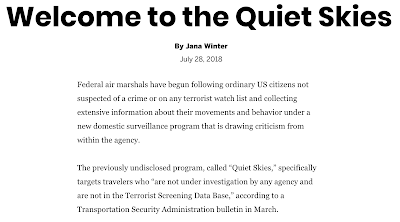 While President Trump has government more conservatively than I expected, he is not giving much indication he is concerned about the privacy of the public and this clearly unconstitutional program.